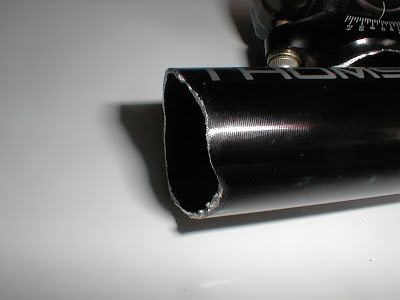 Despite all the reputation that Thomson has in making reliable cycling components and giving the best cushions against catastrophic failures on impact, this person's Elite seatpost (in particular, one of the bolting ears that stick out sideways ) broke off like chalk piece after a fall. The bike was leaned on a wall when it tipped over and fell sideways. Hence, the owner was apparently not even seated on the bike at the time of impact. The seatpost ear broke as he straightened the bike and it dropped in his hand. You can read some back and forth question/answers between me and the owner of the post as you scroll down. That will give some background information into the incident. Compare this to Thomson's marketing literature online. Among several other things, the company happens to generously regard itself as producing the only seatpost in the market incorporating a "bending fuse" against catastrophic failure. 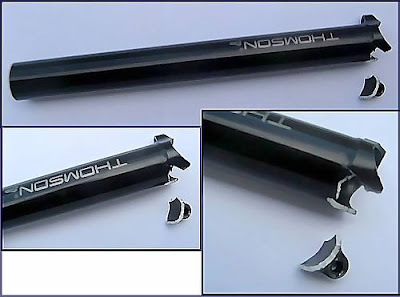 "The Thomson seatpost design incorporates a bending fuse to prevent catastrophic failure. All brand-x seatposts we tested - every one of them - failed in catastrophic failure with the seat and clamp components - and sometimes pieces of the tube and head - flying off in all directions. This type of failure would dump the rider." "Impact absorbing clamps - clamps, head, and assembly will spread and flex on impact to protect seat, rails, seatpost and rider. Easy on seats - allows seat to survive heavy impact loads without bending rails." "Forget the hype! Despite the claim that their seatposts are over "40% stronger" on ultimate strength test than the strongest production seatposts on the market, the Thomson Elite seatpost is not tough enough to withstand even a simple fall. And here's proof of that! This four-year-old post on my GT broke in the upper tube area, which is apparently 'strong enough to withstand 350 foot-lbs of torque', when the bike took a tumble sideways while it was stationary. It didn't "bend slightly" on impact like what the Thomson folks had you believe would happen but just crumbled like a cookie at the top. Actually, the OEM seatpost that I was using before I got the Thomson in a moment of weight-weenie lunacy seemed to take much harder knocks! And it looks like it could take plenty more! So, if you've got an Elite seatpost on your bike, watch out mate! It could be a disaster waiting to happen. " I'm not sure what went wrong at Thomson's end to cause the seatpost to be brittle, but I'm just going to have to drop this one in the "Marketing Mishaps" section for now. This doesn't mean your Elite seatpost has the same problem. But it won't hurt to be informed. Out of 1000 apples, its likely that 2 end up being bad and that's the nature of manufacturing. When those bad apples that dont meet the standards turn into the customer's hands, that's where the issue reveals its uglier side. If Thomson stands by their word, they should delve into this incident and redress the issue (i.e If they are responsible. 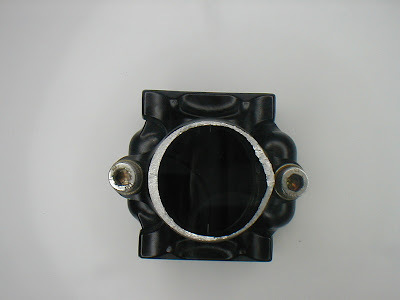 Corrosion, or user over tightening cannot be ruled out at this stage). 1) Did you over tighten the seat clamp outside limiting values specified in the product sheet? Khabar Bike : Not as far as I'm aware of. And it's been untouched since I last changed out the saddle about a year ago. 2) Did you wash the seat post a number of times without letting drying it out? Or have you used the bike a good number of times in the rain? Khabar Bike : Definitely not. And I hate riding in the rain. 3) Is this the first time that the seatpost fell, taking a hit on the same area on the post in question? Khabar Bike : Yes, as far as I can remember. And this is the first time I've ever had a broken seapost in the 12 years I've been a serious bike buff, with seven bikes including a lugged steel Pinarello, an old Trek bonded/carbon road bike and a 12-year-old Gary Fisher hardtail. They have a Syncros, ITM or OEM seatpost. 4) Did you buy the post from a recognized Thomson dealer? Brick and mortar shop? Online? Ebay? The possibility of a knock-off cannot be ruled out. Khabar Bike : Yes. My LBS is one of the most reputable in the area. And the seatpost (paid about $70 for it) came with Thomson's unique but pretty useless bag and folded manual. I also have another Thomson seatpost (with layback), on my hardtail, which has been holding up fine for more than three years. 5) Pretty Useless Bag... the manual was in this useless bag. Did you read it? Khabar Bike : Yes, I did and didn't find it useless at all. 6) Do you recall how the bike fell (orientation)? Khabar Bike : It fell sideways. I picked it up by handlebar and the saddle and the back part broke off in my left hand. 7) Were you riding it when this happened (added weight) or did it free fall as it tipped over (just the bike weight)? Khabar Bike : It was leaning against the wall when it tipped over. 8) Did the seatpost also have the saddle attached during that time? Khabar Bike : Yes, the clamp was secure and undamaged, and still attached to the saddle. Finally, I'd just like to say that I'm not as upset about the whole thing as I would've been a few years back when I was really into lightweight products. These days, anything that doesn't cost and arm and a leg and lasts is just fine with me. DESIGN FEATURES OF THOMSON ELITE SEATPOST. THIS IS A WELL REGARDED SEAT POST AND MANY CONSIDER IT TO BE AMONG THE BEST DESIGNS. KNOWN FACTS ARE GIVEN IN BLUE FONT. ANY EXTERNAL REFERENCES TO LINKS ARE IN RED. This is the patent for the Thomson seatpost in question. The patent is titled "Lightweight High Strength Bicycle Seat Post And Associated Clamp Including Seat Angle Indicating Indicia". The main idea behind the intention was to provide a lightweight, strong seat post that has a wide range of adjustment and adequate cushion against catastophic failure. The product is made from a 7000 series (Zn added) Al alloy and marketing materials claim that it is "40% stronger in ultimate strength tests, and has twice the fatigue life of 75 of the most strongest production seat posts on the market." The post also seems to have what is an obvious anodized black finish. According to Thomson : "The head is not pressed or bonded in. This allows for superior strength and minimum weight, allowing higher strength at low weights." One of the apparent design goals was to make this seat post able to withstand 350 in. lbs of torque, with bending taking place at 250 in. lbs of torque. There appears to be shoulder fillet at the tube-head interface (machined). The bigger the fillet radius, the more the stress concentration factor is reduced. Thomson designers should have selected the fillet radius for a desired stress concentration factor for this shaft for the particular loading case (torsion, tension, bending etc). The critical numbers here are the D/d ratio and the r/d ratio which can be referenced to known and published charts to find the stress concentration factor (you can work backwards in design as well). See Peterson's Stress Concentration Factors by Walter Pilkey for more information. When you first feel the seatpost in your hand, you'll come across the sharp features at the sides of the head. At the edges as shown, chamfer radii appear to be very small, hardly noticeable. See picture below. This isn't a circular cross-section, as you can see. Thomson says : "Natural ellipse bore inside tube for optimum strength to weight ratio." The thickness is higher on the front and rear end of the seat post, corresponding with the directions of the bolt locations on the head above it. If you look carefully to the tube body section under the light close to the logo, you'll see some fine marks/grooves that extends throughout the length of the tube. Is this a deliberate feature to prevent slippage of the post when clamped at the seat tube? Its pretty nice. Here's the top and bottom clamp together with the swivel nuts inside. This arrangement on the tube supposedly allows the claim : "Infinite tilt adjustment minus 5° and plus 29°." The product sheet says : "All Thomson seatposts are designed with positive metal to metal stops. These positive stops and bolt lengths are designed to work together to allow a maximum 5 upto 29 degree down tilt. This means the tilt adjustment of the clamps will be stopped by the positive stop before the back bolt runs out of the nut. This prevents damage to bolts, nuts, ears, and clamps that may otherwise occur with over adjustment." On the product sheet, Thomson mentions very clearly : "Never tighten the front bolt hard against the positive stop. Make sure that bolts are tightened against each other. Always tighten the back bolt to 60 inch lbs of torque. If the front bolt is tightened hard against the front ear, the force created by that tightening will be subtracted from the bolt's available force to withstand high impact loads. If the front bolt is tightened hard against the stop and not against the rear bolt, the rear bolt could loosen during the impact loads." Recommended torque values have been set in the product sheet to 60 inch lbs for each bolt. A warning in the product sheet cautioning that if the clamp lip touches the tube, the seatpost could dimple during clamp tightening. Another warning that post is for use with 7mm seatrails only. Thomson says : "The Thomson seatpost design incorporates a bending fuse to prevent catastrophic failure. 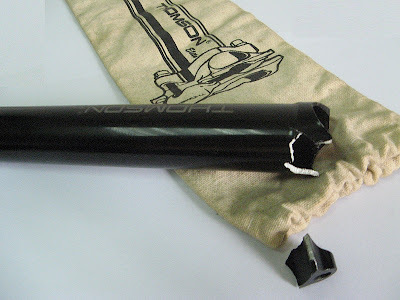 All brand-x seatposts we tested - every one of them - failed in catastrophic failure with the seat and clamp components - and sometimes pieces of the tube and head - flying off in all directions. This type of failure would dump the ride." What stumps me is that for all that marketing on their website, there is actually no bending fuse description on the instruction sheet. I'd actually like to see a description of this and how it works. Is this incorporated into the top and bottom clamp design somehow, and not mentioned? What say, Thomson? "The Thomson seatpost has a clamp, head, and upper tube strong enough to withstand 350 foot-lbs of torque. The tube will start to yield and bend at the seat tube clamp at about 250 foot-lbs of torque. Remember all brand-x posts we tested flew apart at less than 150 foot-lbs of torque. Under severe impact the Thomson seatpost would bend slightly and allows the rider to come to a safe stop or finish the ride. The ride could continue." My thoughts on this statement are that putting this alongside with what was actually observed by the user who broke his seat post (see top picture of failure), the tube did not withstand the force and there was no observation of bending. It appears that the impact forces approached ultimate strength for the broken area in question and broke catastrophically. It looks like the rider was not injured in any serious fashion. What remains to be researched is how the bike with the seat post and saddle fell, validate the claims of the user (see above) when he replied that he did not overtighten any of the two bolts, validate the claims of the presence of a bending fuse and the actual strength of the product from the manufacturer, do a small paper and pencil analysis of the forces and stresses encountered and compare this with known the known design limits of the seat post. The owner has made it known to us that for about a year, he did not have to change the saddle on the seat post. It is likely that during this time, he may have lost notice of the critical areas of the seat post. A stress riser may have led to the formation and propogation of a tiny crack, which, upon the post striking the ground in this fall, led to the severing of one of the bolting spots from the tube due to the torsional shear stresses encountered. What was nice from writing this post so far has been the fact that this issue has been exposed to the world. Users must remain careful of how they install and use cycling products. At the same time, competition in the cycling industry is cutthroat. Over the years, we've seen an increasing number of bad designs with bold marketing claims and promises. Few have stood the test of time. 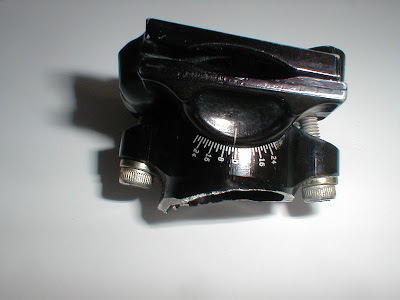 A reader notified me of another Thomson seatpost failure incident, only this time it was a setback post and the failure occurred on the post body itself, very close the bolting ears. These pictures were shown on Mtbr.com Forums, by user Apacherider. Incidents like these are not safe and opens up a range of possibilities for injury. Since the above incident and this new one is not very far apart in occurence date, Thomson must really dig into the backgrounds of the causes. It seems to me as if these posts are in need of more reinforcing in the areas around the bolting ears, including the ears themselves. Did he follow up with Thomson? What did they have to say about it? Also, as the owner of some components that I have seen counterfeited (like Zipp), you can't rule that out. Are we all 100% sure that this post was genuine and passed factory spec? I expect to hear follow-up about this one, I'm very surprised. That is a funny looking fracture path. I wonder if after four years and a little corrosion, that a stress riser had formed and the shock of the fall caused the failure? I see a lot of corrosion in places that have air pollution. For instance, I see much more in Dallas than in San Antonio. Thanks for your great posts! I'd be careful making too many assumptions about what happened and why until such time as all of the facts were gathered. While it's possible that the post may have had a manufacturing defect or simply failed as purported, what's not addressed are things such as how much torque was applied to the seat clamp bolts: it's only 60 in lbs for the Elite and a mere 45 in lbs for the Masterpiece. Just looking at the break, and lacking other reports of similar failures, I'd be more inclined to suspect the torque spec for a seat clamp bolt was exceeded. When I saw your reference to a failure rate of 2 in 1,000, I think of the doctor telling his patient that this particular operation has a mortality rate of 1% and is very safe. "That's fine, but if you are the 1%, you are 100% dead." Could it have been over tightened? That would be my guess. ron : it would be nice to have a closeup pic of the fracture site as well. my feeling is that the failure was caused due to a number of problems as opposed to one. it all comes down like a deck of cards. in this instance it seems to be a defect, but then what you do with the product down the line adds injury after injury and finally, the darn thing just gives up. Not as far as I'm aware of. IMHO, over torque remains high on my list of contributing, if not root cause. Relative torque is just not a safe bet on any lighter weight alloy, alum or carbon components. The fall and impact was likely the coup de grace on a pre-existing condition (preloading the seat post mast well beyond spec) much the same way carbon handlebars and seat posts that are over torqued and damaged during installation will eventually fail a result from debonds in the crush zone. If returned to Thomson (or taken to another precision machined parts manufacturer with full QA / NDI assets and MEs on staff) I'm sure they would be more than happy to conduct an objective fracture analysis that would remove all doubt as to nature of the break. This is frustrating and ridiculous! None of us knows why this failed, yet some seem as if you feel betrayed that it did fail. Bike parts do not last forever, and frankly, I could care less if you or anyone else thinks this is an unintelligent response. I think it is over-the-top unintelligent to act as if Thomson committed some offense because this post broke when you have limited photographs, hearsay, conjecture, and nothing else to demonstrate that it was not abuse, neglect, or inadequate installation. Even with a very limited amount of first hand information, we still are unsure if it was secured properly. Let's not rule out the possibility that this was UNDER-torqued or over-torqued. I do not care how many bikes a guy owns, or how many bolts he has tightened, his hands are not calibrated, and any claims that he can accurately and precisely reproduce the proper torque without adequate tools (used properly) is utter comedy! If we post up for the world to see every time a part breaks from "JRA" and act as if the manufacturer is likely to blame, you are going to need a lot more bandwidth. I have heard a lot of JRA BS over the years...pardon me for remaining skeptical. Overtightening, overtightening, overtightening. If the owner is legit, have him send the seatpost to Thomson and the great staff there will check it out, determine what the problem is. They will sort him out as well. Thomson has been great to me and I own a pair of Thomson masterpieces myself and an X2 and X4 Elite stem. Last 2 comments are SPOT ON !! Super, over high expectations always end in disappointment - or a destructive 'blame-game'. Ron, is everything you do 100% squeaky perfect ? - if so then fine. Otherwise follow the advice in the last 2 posts. The Profile Racing BMX freestyle and race teams have been using Thomson seatposts on their bikes for years, and I guarantee that each of those seatposts have been involved in multiple impacts as severe as any you could imagine, particularly the freestyle team, and to my knowledge not one has ever broken. I'm not saying it's impossible, but it's highly unlikely that the person with the broken seatpost has told us the whole story. If I had to guess I'd say overtightening as well. Why are people headbutting the owner of the seat post? Do you need a 100 dollar torque wrench to calibrate a seatpost clamp? Really? With carbon, you can't afford to be careless really. But you can wing it with aluminum, assuming you're not out of your mind to give it 15 turns past its max limit. I don't think this is an over tightening issue at all. No you do not need a 100 dollar torque wrench. A good torque wrench can be had for much less. Perhaps you do not need a torque wrench at all. OTOH if you want to start your posts with "Forget the hype!" or call it a "marketing mishap", you might want to make sure you did everything correctly before you try and cry to the masses and stick the turd in someone else's pocket. The hype is right there on the OP's Blog. It should have said, "I broke a bike part, I am not sure how, but I sure hope the un-named manufacturer will handle things properly." Then report back later with results. Nope! Instead a bunch of hype was created and then surrounded by a bunch of BS. Until someone with real credentials has a look at this thing, I see no other appropriate reaction other than to think this person is trying to force a manufacturers hand by trying to air some laundry that may not even be dirty. Thomson's reputation speaks for itself. If you think it is wrong for me to side with them...Tough. Thomson has demonstrated years of great customer service, and good design. This thread and the Blog of the OP has not demonstrated anything that makes me question Thomson's reputation. Do you need a 100 dollar torque wrench to calibrate a seatpost clamp? A high-quality beam-type torque wrench is about $30-$35. Of course, once you have the torque wrench you'd need to find the torque specs for a given component and that too takes a certain level of discipline and attention to detail. Really? I don't think this is an over tightening issue at all. Based on which of the very few facts that have been presented here? Or, is it simply the truthiness of the whole situation as someone who has emphathy for khabar bike? Seriously, slippery slope and red herring arguments or empathy are not substitutes for facts which are still in short supply given the tenor of the original posting. BB : I doubt that. If that's the case, they would have received a warning that their email is nearing the quota limit. In my opinion, I see this bending fuse idea as nothing more than that extra safety factor, which is nothing new and has been known in engineering since the Byzantine empire. To say that this idea is not used by other seat post manufacturers (or prior art) is...well, is that really true? Ron - Maybe they meant that similar lightweight (weightweenie) posts in the market favor lightweight over strength and factor of safety. I'll be hard pressed to believe that commonly used, mainstream AL seatposts don't take factors of safety into account. Ron wrote If you have any more explanations to make the bending fuse a legit innovative idea, let me know. But for now, I feel the term is misleading in that I thought it was a separate component on the seatpost. Good grief... The bending fuse is a 'failure mode'. Now, what is it about the Thomson seat post shaft's design that makes it unique AND that would cause it to bend and fold instead of fracturing? Look at your own post again and the design drawings and you'll see that while the post has an oval outer diameter (OML), the inner diameter (IML) is ovalized such that the side walls are thinner than the fore and aft walls instead of being symmetric around the entire shaft. Intuitively, one would expect the sidewalls to deform well before the yield strength of the thicker fore and aft cross sections of the shaft were reached and thereby allow the post to fold instead of fracturing and that's what I believe is described in their Patent and conveyed in their literature, albeit in less that explicit terms. Ron wrote: Since Thomson has not stated that the bending fuse is the elliptical inner cross section, I will not do so either. Go read up on the concept and use of a 'structural fuse'. 60 in-lbs is not a lot of torque. With adequate experience tightening and loosing bolts, any person can go by 'feel' and tighten by hand. You don't and I repeat, you don't need to purchase a 50 dollar torque wrench just to tighten bolts on your seatpost. If you're not confident about it, hand it to your LBS and they'll take care of it. This is Dave from Thomson, email is dparrett@lhthomson.com . First, we will replace a failed part out of goodwill. Second, you simply can't generate enough force riding to break the front ear of the post. That failure is from overtorque. From past experience the bolts were probably near yield at 125+ inch pounds.